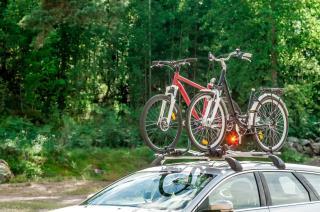 (Newser) – You could argue that having a roof rack on your car makes it easier to stay fit: Throw a bike or skis on top, head over to the park or slopes, and burn off some calories on the trails. You could also say it makes your car less efficient—and you'd be right, per new research from scientists studying the effects of using such a contraption, Scientific American reports. In their fuel consumption study in the May Energy Policy journal, researchers Alan Meier and Yuche Chen studied how the racks affected what's called aerodynamic drag. Their findings, based on their compilation of "real-world usage data": that the resulting drag in cars with top racks was responsible for 0.8% of light-duty fuel consumption in 2015, roughly equal to 100 million gallons of gas. This effect could result in a car owner's yearly gas bill jumping up 25%. Hmmm ... reduces fuel efficiency by 0.8%, which results in a 25% increase in fuel costs. This author must be moonlighting here. Her regular job is obviously working in a government bureau analyzing global warming health risk impacts!! How corporate to blame bicycle racks for poor gas mileage rather than inefficient automobiles. There is no reason for cars to weigh 3600 pounds and stand seven feet tall. Thanks for the study, but please don't mandate some kind of law of unused roof racks.